On a crisp, sunny morning last spring, I headed to the Okanagan from Coquitlam to attend the Interior RV Consumer Show in Penticton. I make this trip annually to distribute camping directories for British Columbia but this year decided to take my time and explore some RV Parks in the South Okanagan. My destination on the first day was Osoyoos. I headed through the Fraser Valley on Hwy 1 to Hope then took the Crowsnest Hwy (Hwy 3) which is a gorgeous scenic drive over mountain passes and along rivers into the lush agricultural lands of the Okanagan with an abundance of orchards, vineyards and more. Along the way it’s worth taking a break at Manning Park. In the picnic area you’ll see marmots scurrying in and out of underground burrows and bold whiskey jacks looking to share any snacks you are eating. Further on is Princeton which has several family style cafes, pubs and bistros to suit everyone’s taste. I recommend a stop here if you are wanting refreshments. On your way to Osoyoos you will pass through the quaint mining town of Hedley and the self-described “fruit capital of Canada” Keremeos. April is a little early to buy local fruit but the many fruit stands are open and worth a visit. Leaving Keremeos you head southwest to Osoyoos passing through Oliver. Check out the blog Take a Break Along the Crowsnest Hwy for more things to see and do along this route. I arrived at my first overnight stop of Nk’Mip Resort in Osoyoos. This is a popular RV park with some 350 sites including 120 lakefront sites on the beach, 30/50 amp service, tent sites, convenience store, marina with equipment rentals, boat launch and more. This resort is a wonderful spot to stay as it has so much to offer. In addition, the Restaurant at Spirit Ridge serves fabulous food, then there is the Solstice Spa, Desert Cultural Centre, Nk’Mip Cellars, Vineyard & Winery, Sonora Dunes Golf Course. And it’s only a short 2 km walk or drive to the main street in Osoyoos. After a good night’s sleep, I left Nk’Mip to head back to Penticton. Before leaving Osoyoos I decided to try the local neighbourhood café, JoJo’s, which is situated on the main street. What a great find. They make everything from scratch and if you are craving a muffin, cookie or eggs benny this is the place to go. After enjoying a tasty breakfast I headed to Gallagher Lake Resort in Oliver. They have several lovely camping cabins near the beach and over 140 campsites. There are many amenities available including RV hookups, a convenience store, laundry, plus for the energetic – tennis, pickleball, volleyball court, and for the less strenuous – horseshoe pits. 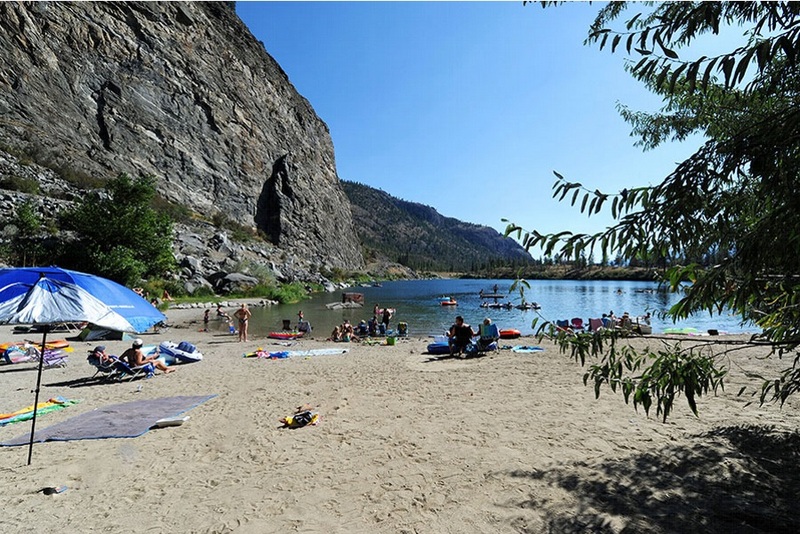 The campground is right on Gallagher Lake with their own private sandy beach. Whilst in Oliver I also dropped in on The Orchard at Oliver, an RV park & motel. The campsites are set in a beautiful orchard and is a great place to relax and take in the laid-back atmosphere that is the Okanagan. You can also try something different and rent one of their rustic cabanas. After leaving Oliver, I stopped for a quick snack in Okanagan Falls at Tickleberry’s. I had never visited before, so it was a special treat. This is a family-run business known for its delicious homemade ice cream of over 50 flavours, homemade fudge, chocolates, kettle korn, and a wide range of gifts and local crafts to purchase. This is a fun experience and well worth the stop. The last campground I visited on this trip was Barefoot Beach Resort in Penticton. This is a fairly new resort opposite Skaha Lake offering Yurts and tenting sites. Each yurt comes with a deck, two chairs and BBQ and lovely landscaped grounds. You can also enjoy the Barefoot Beach House Restaurant and Beverage House, relax on the roof top patio and enjoy fresh, Spanish-inspired cuisine, with a frosty margarita in one hand and some fantastic food in the other. They also offer a juice bar, second scoop ice cream and a rental hut and beachwear for all your needs. From Barefoot Beach Resort I headed to the Penticton Trade & Convention Centre for the Interior RV Show. It was a whirlwind visit to the South Okanagan and next time I shall visit longer and take a few side trips to local wineries. For the many camping opportunities in the South Okanagan and all of BC check out Where to Camp at Camping & RV in BC. Anne Philley has worked for the BC Lodging and Campgrounds Association for sixteen years and is their Membership Services Co-ordinator. Anne loves to travel and has visited many parts of British Columbia. She has extensive knowledge within the camping and lodging sector. Anne is the face of Super Camping, distributing 40,000 camping packages at BC, Alberta & Washington State RV Consumer Shows. 0 thoughts on "Exploring Four of the Best RV Parks in the South Okanagan, British Columbia"